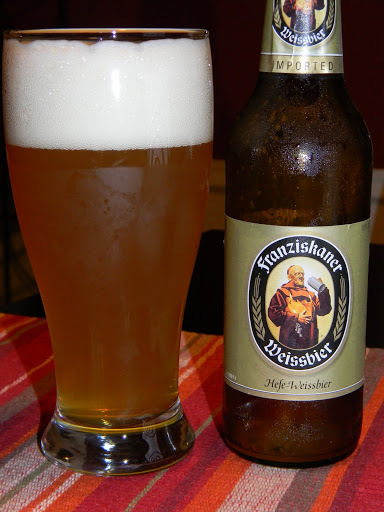 Franziskaner | Beer Apprentice - Craft Beer News, Reviews, Interviews and Info. Hi guys. For today’s craft beer review I’m going to be drinking the Franziskaner Weissbier Dunkel produced by the Spaten-Franziskaner-Brau Brewery located in Munich, Germany. I’ve always been somewhat mixed when it comes to the Dunkel style, however I enjoyed the Franziskaner Hefe-Weissbier fairly well, so I thought I would give their Dunkel a shot. From the website, franziskaner.com, we find this description. This brew comes in a 16.9 oz. bottle and it has an ABV of 5.0%. It poured a deep brown to deep mahogany color with some copper/rust highlights at the bottom and around the edges. The collar was eggshell colored and sized ok. It was very smooth and creamy. The retention time was decent and the lacing was not as nice as I had hoped. The nose brought out a good bit of banana and spicy clove. Hints of toasted grain and yeast. It smelled very earthy to say the least. At one point I got some sort of dank, musty, dirty smell that distracted me for a minute or two, but as I continued to sniff it dissipated about as quickly as it appeared. The taste was very similar to the aroma. Sturdy tones of banana and clove. Again, plentiful amounts of toasted grain along with a yeasty/wheat bready malt accompanied by some “earth”. Just a smidgen of caramel sweetness was found as well and it was hidden deep within. The mouthfeel was medium bodied. I found it to be a touch watery, crisp, refreshing and quite thirst quenching. The carbonation was low to medium and just a slight bit of flavor was left on the palate after each gulp. Well, this beer was ok. It didn’t really provide anything extraordinary or outstanding in my novice opinion. It had some decent characteristics and the ease of drinkability was rather good, however I just didn’t find it to be the Dunkel that really turned me into a fan. Don’t let my assessment deter you from giving it a try though. I had no problem drinking it and I don’t think I would ever turn it down if it were offered, but if left to my own choice, I don’t know that I would reach for this beer on a regular basis. 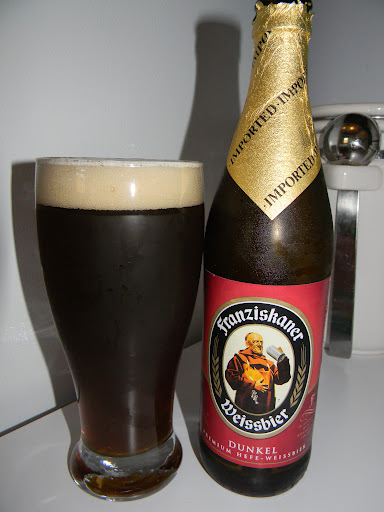 Have you guys ever tried the Franziskaner Weissbier Dunkel? What did you think about it? Did you like it? Are you a fan of the Dunkel style? Be sure to leave a comment or two and let me know your thoughts and feelings.